So Irish National Accounts data for 2Q 2015 was released today. Brace yourselves for series of blog posts here and a torrent of congratulatory waffle across the media. 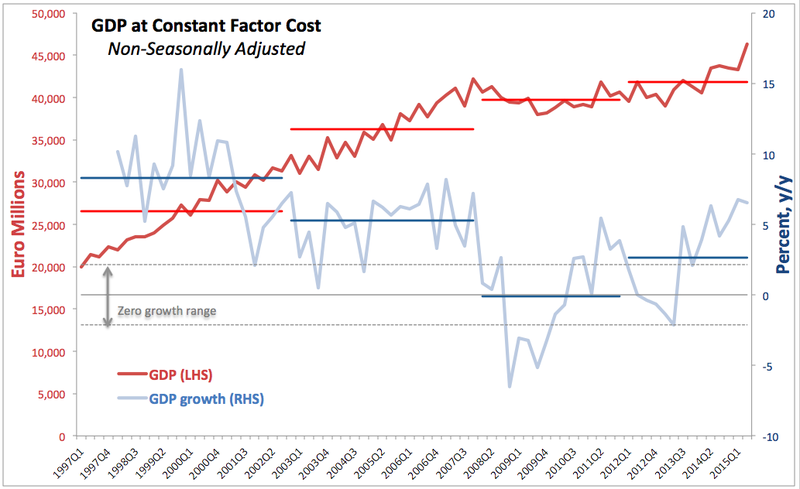 Starting, as I always do, with sectoral composition of growth, using GDP at Factor Cost figures. All referenced here are in real terms (inflation-adjusted) and seasonally unadjusted so we can look at what matters most: annual rate of growth (y/y). Agriculture, Forestry and Fishing sector contribution of GDP in 2Q 2015 was EUR1.341 billion (yeah, that's right… just that much). And this figure represents a decline of 1.18% y/y. Ugh… growth it ain't. But good news is, sector output grew 5.57% y/y in 1Q 2015, so for the year to-date we are still up cumulative EUR32 million in the sector (+1.44%). 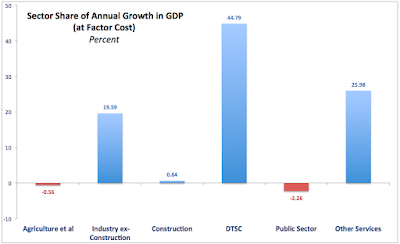 Still, a year ago in 2Q 2014 the rate of growth in the sector was 23.8%. Industry (inclusive of Building & Construction) output contribution to GDP was EUR13,711 billion. Aha… more than ten times that of Agriculture Forestry & Fishing sector. But never mind, we don't call Ireland the Widgets Island… So the sector grew 4.36% y/y in 2Q 2015 which adds to 10.52% growth in 1Q 2015. Healthy numbers all even though 2Q was a slowdown. And a year ago, in 2Q 2014 things were even more heated - then sector grew at 14.7% y/y. But 1H figure is pretty healthy all around: up EUR1.739 billion in 1H 2014 (+7.18%). Take some decomposition of growth in Industry. Transportable Goods Industries and Utilities sub-sector (aka Pharma MNCs Central) grew at a hefty rate of 11.2% in 1Q 2015 and this fell to 4.64% y/y growth in 2Q 2015. Again, sub-sector growth was weaker in 2Q 2015 than in 2Q 2014 (+14.71% y/y). However, Transportable Goods Industries sub-sector was the biggest contributor to growth in 2Q 2014 of all Industries, but more on this below. 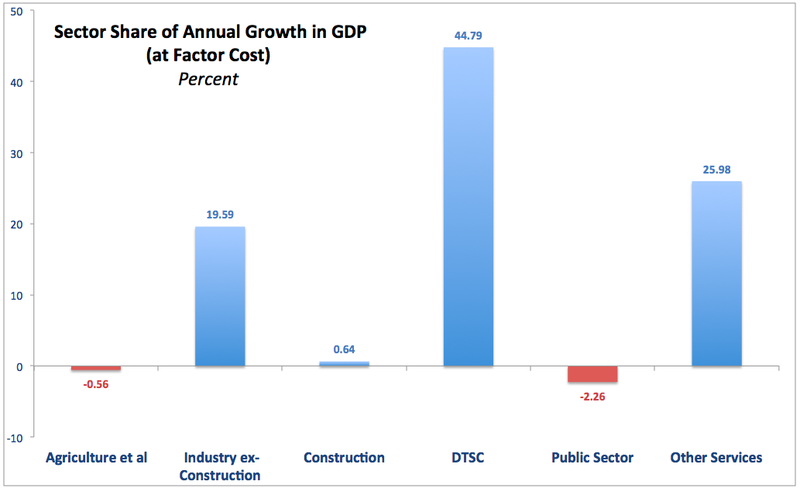 Meanwhile, Building & Construction sub-sector expanded by 4.41% in 1Q 2015 and this sub-sector managed to grow only 1.52% in 2Q 2015. For all the ink expended by irish media pushing revival of the Construction sector stories in recent months, 1H 2015 cumulative y/y growth in the sub-sector was just EUR64 million (+2.87%). Still, growth is growth, right? Distribution, Transport, Software and Communications sector (aka non-Pharma MNCs Central) was the booming one this quarter. In 1Q 2015 this sector expanded output by 9.64% and in 2Q 2015 this rose to 11.40% y/y. Yes, folks, things are doubling in this sector faster than every 7 years (pretty soon, all Beemers in the world will be made in Drogheda and all Mercs will be stamped out in Wexford). Back to numbers: this sector is now almost as large as the entire Industrial sector in Ireland at EUR12.398 billion 2Q 2015 contribution to GDP. Over 1H 2015 the sector added EUR2.335 billion in growth to the GDP, more than any other sector in the economy and its output was up 10.52% y/y. Public Administration and Defence sector continued to shrink in 2Q 2015, falling 4.05% y/y after having posted a 5.45% contraction in 1Q 2015. The sector managed to subtract from GDP growth some EUR147 million (-4.74%) y/y over 1H 2015. Other Services, including rents, sector was up steady 4.35% y/y in 2Q 2015 having previously grown 4.42% y/y in 1Q 2015. Over 1H 2015, compared to 1H 2014, the sector contribution to GDP expanded by EUR1.48 billion (+4.39%). 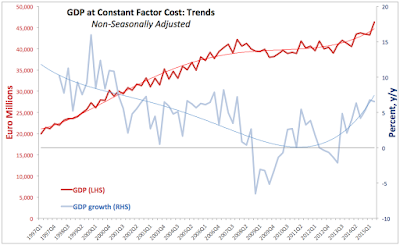 The above shows that GDP at factor cost grew by 6.52% y/y in 2Q 2015 down slightly on 6.77% growth in 1Q 2015, but still fast. GDP at factor cost expanded by EUR5.576 billion in 1H 2015 compared to 1H 2014 (+6.64%). Very fast. Which is good news. 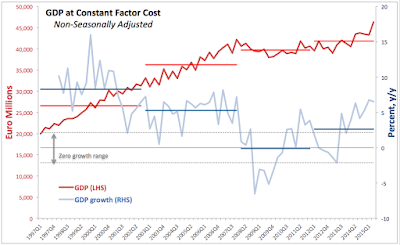 As chart above shows very clearly, level of GDP at factor cost came in as a slight surprise above the simple polynomial trend line, but growth rate in GDP has both moderated in 2Q 2015 compared to 1Q 2015 and came at below the trend line. Which begs a question: what are all those analysts who underestimated GDP growth use for a model?.. 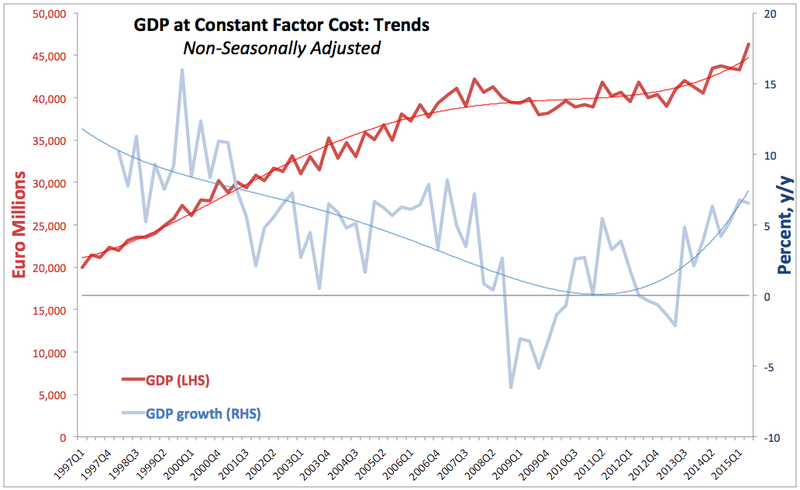 But never mind - forecasting Irish economy is a hazardous task. Summary: so what has been happening over 2Q 2015 and 1H 2015? Yes, we have growth and fast growth at it. Mostly, it is broadly-based across various sectors. But dominant sectors that act as two leading (by a mile) sources of growth are Industry (ex-Building & Construction) dominated by Pharma and Chemicals, plus Distribution, Transport, Software and Communications sector, dominated by non-Pharma MNCs. Interestingly, last year, 1H 2014 growth y/y involved much shallower expansion of output in Distribution Transport Software and Communication sector (+4.62% against this year's +10.53%), which possibly signals amplified tax optimisation and exchange rates effects of MNCs activities in the sector. Growth was much stronger in domestic sectors a year ago than in 1H 2015: Agriculture (+20.87% y/y in 1H 2014 against +1.44% in 1H 2015) and Building & Construction (+12.5% y/y in 1H 2014 against +2.87% y/y in 1H 2015) sectors. Y/Y 2Q 2015 growth was slower than 1Q 2015 across all sectors other than Distribution, Transport, Software and Communications sector. Annual contraction rate moderated slightly in Public Administration sector in 2Q 2015 compared to 1Q 2015. We can't say much about quality of growth beyond that... But stay tuned for more detailed analysis of National Accounts data later.